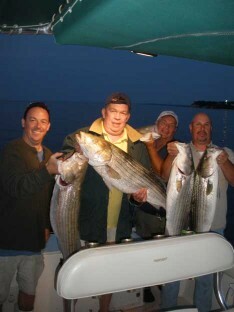 Free Fishing Reports > Northeast > New York > North Shore > Evening Bass Bite Continues! After work, friends, Mike, Kenny, Steve, Ed and Capt. Skip went out to see if the jig bite was on, and YES it was!. The Boys had their limit of Bass to 23 lbs. Steve was high hook with the 23 lb. Bass caught on light tackle. 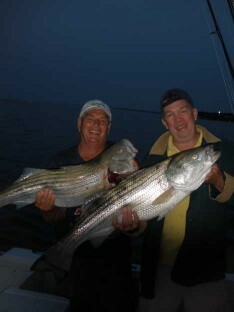 Other big fish were caught by Kenny, but it managed to get away close to the boat. All fish were in the 13-23 lb. range. Everyone on board caught fish jigging as well as on the troll. What a great night of fishing and laughs!